After teasing us for a few years, Nissan has finally introduced the GT-R in the Indian market. The GT-R is Nissan’s halo product and though there are quite a few GT-Rs in the country, the company never officially launched the car, till now though. The GT-R is priced at Rs 1.99 crores ex-showroom Delhi. For the time being, the GT-R will only be sold through one dealership in India, Neo Nissan in Noida which will also be India’s first Nissan High Performance Center. This will also be the only service station that will cater to the servicing of the vehicle as well. The current GT-R, which has been launched in the market was introduced earlier this year at the New York Motor show. With this new update, the GT-R gets a more aggressive front end, including new headlamps, new grill, revised bumper both at front and the back, new spoiler and new tail lmaps. The main changes though are on the inside. While the previous GT-R didn’t feel very luxorious on the inside, this one has been updated to feel just so. So there is a new 8.0″ touch screen infotainment system along with new interior trim options. Though there is a Bose sound system with 11 speakers on offer, we are pretty sure you’d rather hear the exhaust note, courtesy the titanium exhaust system. 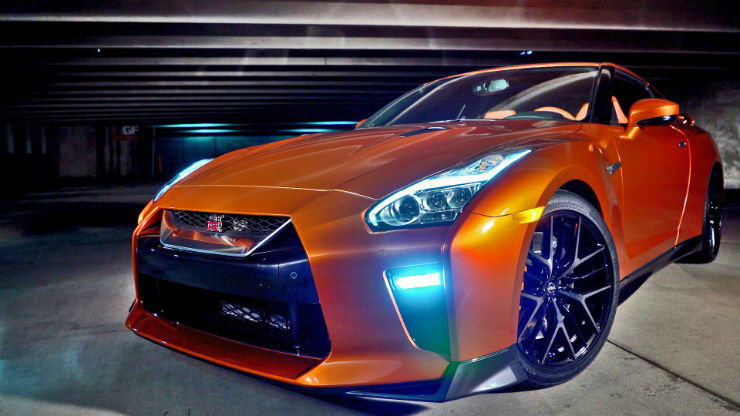 Powering the GT-R is a 3.8 liter twin-turbo V6 making 565 Bhp and 637 Nm. The engine is mated to a 6 speed dual clutch automatic transmission and power is transmitted to all 4-wheels. To keep weight as low as possible, the car is fitted with 20″ forged aluminium rims with a ‘Y-spoke’. The vehicle will be available in a total of 7 exterior shades and 4 interior shades. With the deliveries of the vehicle beginnning, actor and Brand Ambassador of Nissan, John Abraham not only launched the car but also became the first person to take delivery of the same. A very excited John said that ” I have had my heart set on the GT-R from the first time I saw one. I consider it to be an embodiment of myself on four wheels- powerful, muscular and fast. When I drove a GT-R earlier this year I knew I had to have one, and today my dream has come true”.